The other day I was looking at Samsung Chromebook laptops. It’s the latest fad in giving laptops something to do in the post-PC era. They’ve largely replaced netbooks for “surfing with something that’s not a tablet”. 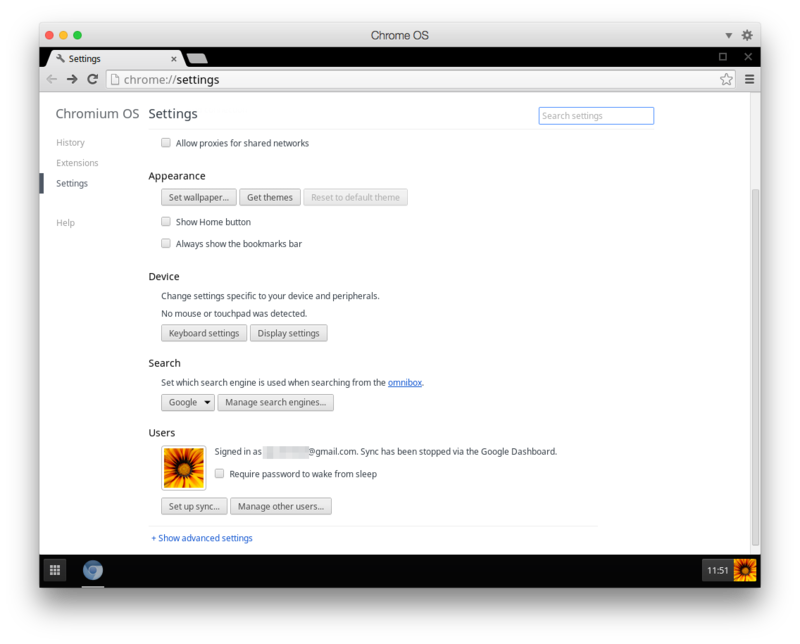 There’s really nothing to do here, except for launch the web browser – which is precisely what a Chromebook is supposed to do: you don’t install anything, you don’t maintain anything. You can just about edit some super basic settings, such as the background picture and which Gmail account you’re using for all this, and even those settings are presented in a web browser. What’s interesting about these types of devices is the price point: at anywhere between $200 and $300, the entire Chromebook costs as much as an Intel i5 CPU, without a keyboard, screen, battery or anything else. The device has very limited storage: nothing like your 500GB hard disk. Instead it has 16GB of internal storage, sometimes a little more – much like an SD card. The RAM isn’t anything exciting either: while Windows and Mac really need 4GB minimum just to check your email, a Chromebook only has 2GB tops, sometimes even less. I know this sounds ridiculous because we’re so used to large hard disks, huge amounts of memory and beefy graphics cards. But it’s the operating system that asks for those things in quantity – it doesn’t necessarily have to be that way. We’ve been conned into thinking that such powerful hardware is necessary to accomplish basic day-to-day tasks. What Samsung have done here is very interesting, and it appears to be an emerging trend in the gadget industry: they’ve taken their own Exynos chip and attached some different peripherals. The Exynos is an ARM based system on a chip, commonly found in Samsung’s mobile devices such as the Galaxy phones and tables. The Exynos is the equivalent of Apple’s A-series of chips found in iPhones and iPads: it provides not only the CPU, but also graphics and network capabilities, all with a very small footprint. Using this approach for laptops rather than small mobile gadgets is something we haven’t seen before. Up to now, everything in a laptop was Intel or AMD based to be anywhere near useful. All these ARM based systems are less power hungry too, much cheaper to produce, and up to now less beefy in regards to performance. The Raspberry Pi uses one for example, as does the iPhone (that A-series is indeed based on an ARM chip too). At the same time, these cheap ARM devices seem to be getting faster and faster and will very soon be an alternative for running more power hungry desktop applications. I hear for example that the Apple A8x chip in the iPad Air 2 is now as fast as the Intel i5 chip found in a 2013 MacBook Air. So the question is: does the average user NEED a super fast device just to access email and web applications? It’s all up to the operating system to make use of these chips – and of course Windows and Mac OS X won’t be able to run on those devices at the moment. But Linux – that’s a different story. There are distributions like Fedora and Ubuntu which are just as happy running on an x86_64 system as they are running on an ARMv7 and above. It’s a frightening thought, but I’m currently running Fedora 21 on my Nook Tablet from 3 years ago! Sure it’s super slow, but I can speak to it just as if it was a powerful server in a data centre. What Samsung call Exynos, and what Apple call the Ax series, Intel call the Atom series. It’s the same idea, providing a system on a chip based on an Intel CPU. These first debuted in Netbooks in 2009 and have since been used in some Android phones too. Will these low-cost chips change the world? Will they soon overtake the power of the Xeons? Will we one day go back in computing power and instead be happy with something slower than what we had before? Is that why the 2014 Mac Mini is already slower than its predecessor? Will we soon see a MacBook Air powered by an A9 chip? Or instead tablet devices that are faster than our desktops and laptops? Who can tell. It’ll be exciting to watch what happens next. At least one of the big companies is preparing such an eventuality: Windows 10 will be available for ARMv7 processors.